Intersections present special problems and unsafe conditions for cyclists, so when proceeding straight, moving to the center of the through lane is legal and recommended, even if a bike lane is present. 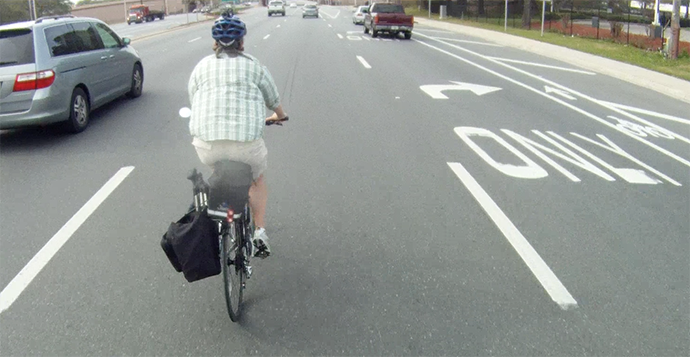 Cyclists are frequently subjected to a “right hook” by other drivers turning too closely in front of them. Those motor vehicle operators are violating a number of laws and unnecessarily endangering the cyclist to simply save a few seconds. Drivers are required to safely move as far right in the roadway to prepare for a right turn, even if that means moving into the bike lane. 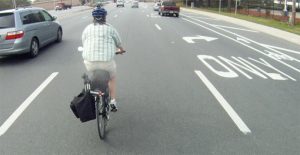 Bicyclists are entitled to the use of the full lane being used to prepare for a left turn.